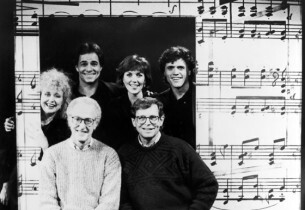 A revue consisting of the songs composed by David Shire and Richard Maltby, Jr., Closer Than Ever enjoyed a healthy run of 312 performances at the Cherry Lane Theatre in New York, where it opened on November 6, 1989, following a tryout presentation at the Williamston Theatre Festival in Massachusetts. 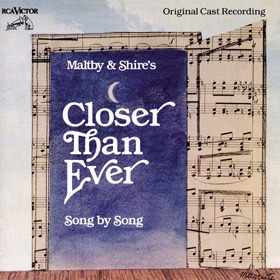 “A bookless book musical,” it began as a one-act play conceived by Steven Scott Smith, who later expanded it into a two-act production, with Maltby taking over as director. Shire is a well-known film composer, whose many credits include 2010, Farewell, My Lovely, All The President’s Men, the score for Saturday Night Fever, and The Conversation, which was directed by Francis Ford Coppola; Maltby is best known for the two revues he conceived and directed, Ain’t Misbehavin’ and Fosse, both of which enjoyed long runs on Broadway. 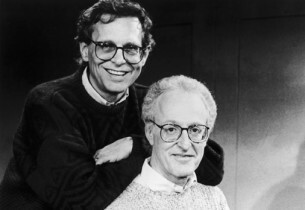 He and Shire met at Yale in their student years, and have been occasional collaborators ever since.